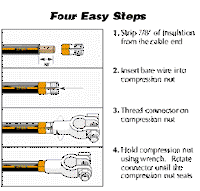 Please click onto: How to install a compression terminal. are tin plated to resist corrosion. 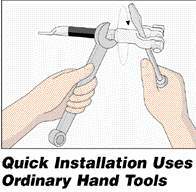 Installs with common hand tools - ideal for field repairs. soldering, this is an excellent alternative. 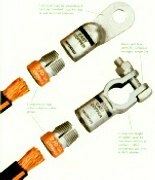 All of the lugs on this page have a 3/8" hole. This 4 gauge size is limited to stock on hand. You turn the lug, not the fingered collet. We include an instruction sheet with every order.